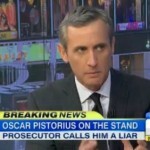 Dan discussed the latest on the Oscar Pistorius trial this morning, Thursday, April 10th on Good Morning America. Pistorius was on the stand for the second day of cross examination. The lead prosecutor, Gerrie Nel, known as the “bull-terrier” has been asking Pistorius tough and central questions to the case, including: why did he fire those four shots into the bathroom door? Pistorius was unable to answer whether he meant to shoot or not. Nel was trying to catch Pistorius with inconsistencies in his story and insisted that Pistorius was incapable of accepting responsibility for his actions. Nel has also been focusing a lot on the text message exchanges between Steenkamp and Pistorius. Says Dan, ” The prosecutors introduced this saying some of them are very incriminating, for example she said at one point she was scared of him. Some of this cross examination has been more effective than other points, I mean he is getting bogged down a little bit in some of the minutia about the texts but there are some very valid points that he is making here. Watch the full clip here.